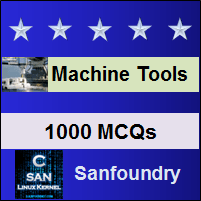 This set of Machine Tools Multiple Choice Questions & Answers (MCQs) focuses on “Shaper Basics – 1”. Explanation: All mentioned are the parts of tool head. Toolhead of a shaper holds the tool rigidly and provides vertical and angular feed movement. Explanation: All mentioned are the parts of shaper. Due to these parts, this machine is arranged in such a manner that it can produce flat surfaces easily and perform other operations too. Explanation: All are the parts of shaper. Column and pillar are used to stabilize the machine and are mounted on base. The frame is the basic structure of this machine. 4. The base of the shaper is a heavy cast iron casting. Explanation: As per the construction of the base. It must be made of heavy cast iron casting because the whole machine including pillar, frame, column are mounted on the base. So base must be capable and strong enough to withstand it. 5. Which of the following part of shaper supports the entire load of the machine? Explanation: Base of shaper supports the entire load of the machine. All other parts are mounted on the base. It is the basic foundation of this machine. 6. The base of the shaper is not able to withstand the vibration. Explanation: The base of shaper is able to withstand the vibration. In shaper, reciprocating feed is given so there is always a chance of higher vibration and since the entire machine is mounted on the base it is necessary that this base must be able to withstand vibration for the safety purpose. Explanation: All are the parts of drive mechanism. Shapers may have drive mechanism or hydraulic mechanism. 8. Quick return mechanism is responsible for ram movement. Explanation: As per the working of quick return mechanism. Whenever there is a need to convert rotary motion into reciprocating motion, quick return mechanism is used. Explanation: As per the construction and working of shaper body. Guideways are like a track or path and ram is a reciprocating member of shaper. 1o. Saddle slides along the ram. Explanation: This is false. Saddle slides along the crossrail which holds the table firmly on its top. To practice all areas of Machine Tools and Machining, here is complete set of 1000+ Multiple Choice Questions and Answers.